This book has become an instant classic for no-limit hold'em tournament players. In case you aren't familiar with him personally, Dan Harrington was the 1995 World Series of Poker Main Event Champion and perhaps even more impressive were his back-to-back final table finishes in both the 2003 and 2004 Main Events. This volume is the first in a two-part series intended to cover No-Limit Hold'em tournaments from beginning to end. To begin with, I feel like this is the best book out there for tournaments. Harrington's writing style is easily read and I think that players of any skill level will find value in it. After each concept, the book provides many example hands to test your skills. Besides just telling you the correct answer, Harrington will go into detail on why it is the proper play. This first volume is mostly dedicated to the beginnings of tournaments where the blinds are still relatively low in relation to the starting chip stacks. Some of the early topics include starting hand requirements, and I think that his guide is one of the best sets of tight-aggressive strategy available. Another important concept that is discussed for beginners is pot odds, which obviously plays an essential role for making decisions. Perhaps one of the most valuable tools in this book is the discussion of the continuation bet, which is much more successful in tournament play. Overall, this is an excellent text for beginners into tournaments and the no-limit hold'em format. 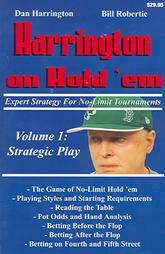 While you may find some topics valuable for no-limit ring game play, I recommend that you use the starting hand standards and most of Harrington's advice for tournaments. More advanced players should be able to pick up on some new concepts and add at least some versatility into their tournament playing style. It's a smooth read that you should keep around as reference between playing sessions. This was also written with online poker in mind, so you'll see tips on Sit 'n Gos and satellites as well.